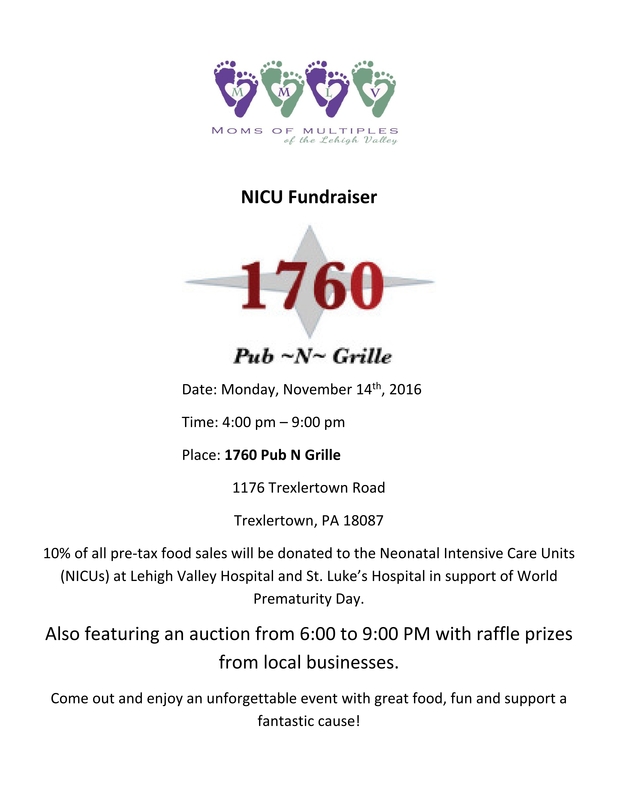 Join us at our Upcoming NICU Dine and Donate Fundraiser! 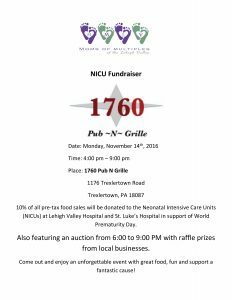 Moms of Multiples of the Lehigh Valley (MMLV) is organzing a Dine and Donate event to benefit the Neonatal Intensive Care Units at Lehigh Valley Hospital and St Luke’s. Join us at 1760 Pub n Grille on Monday November 14th anytime from 4-9pm and 10% of your food sales will be donated! We will also be hosting a raffle table at the restaurant to raise additional funds! Raffle baskets and gift cards are generously donated by members and local businesses. 100% of ALL proceeds go directly to our NICUs! Come out to support a great cause!